Belitung is the island in Indonesia from which Billitonites are derived. 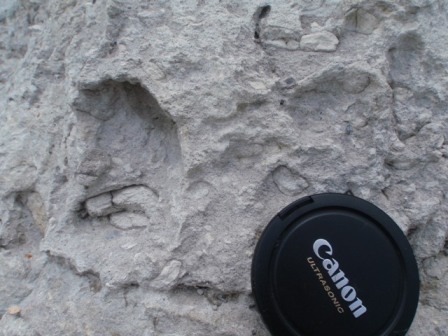 Billitonites, whilst sculpturally overlapping with Philippinites are distinct in sculpture - deeply etched with U-grooves. 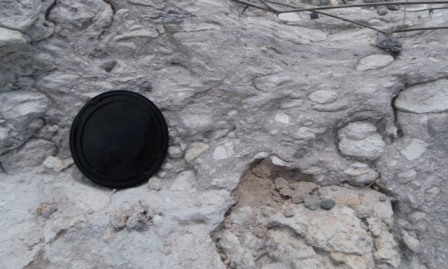 It remains uncertain whether this exposure was in situ or constituted mixed up, dumped and compressed material. 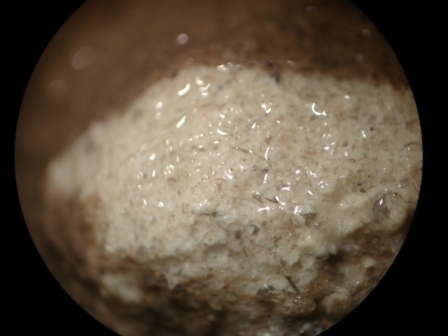 Having investigated the nature of the material the author considers it probable that the samples are probably mixed-up and re-constituted material. Nonetheless, valuable data can be gleaned from these samples. The sands and clays we are looking at represent weathered granite. Belitung island is atop a granite batholith, hence the tin deposits. 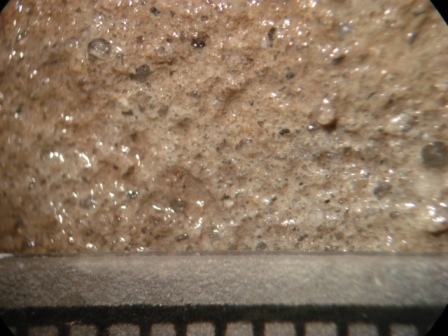 ABOVE: Dry sample. Millimeter scale divisions. 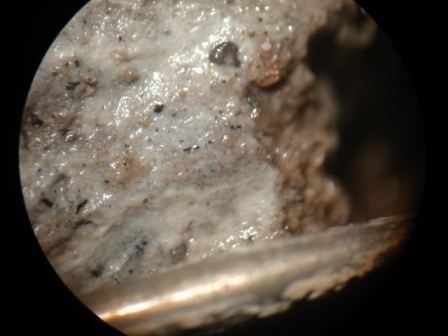 ABOVE: Dry sample showing contact between white clay-rich lithology and grey sandier lithology. Millimeter scale divisions. 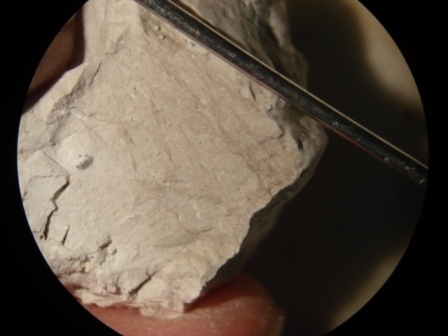 ABOVE: Whiter clay-rich material - note the numerous quartz grains though. 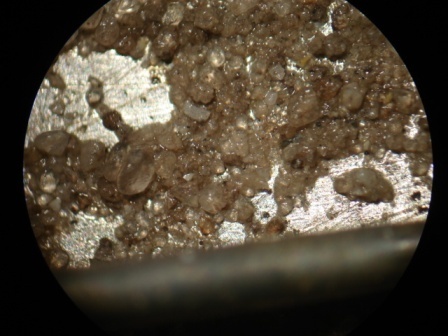 ABOVE: A close up of the quartz grains enclosed in the matrix. The quartz grains are typically under a quarter of a millimeter diameter, usually much less. I was surprised at how the lithologies appeared to have relatively low porosity and permeability (I am sure it is much better than it appears though). I wonder if the key to Billitonites being heavily etched is the seasonality of rainfall. Does this allow for acid attack on the alkaline components in the glass then the water sits there, becomes more alkaline and attacks the silica network. Next season maybe replaced by acidic waters again. I'm sure there is a study to be done there! 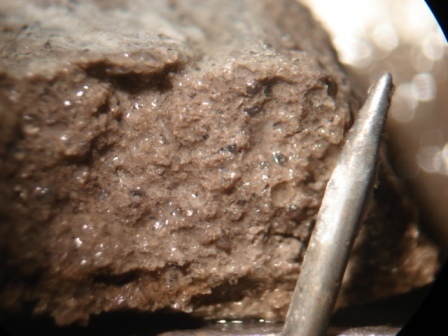 ABOVE: Another close-up of the lithology with millimeter scale divisions. ABOVE: Another close-up. The metal bar is 1mm in diameter. ABOVE: The metal bar is 1mm diameter. ABOVE: Some specks of an opaque mineral. I suspect this the tin ore? The metal rod is 1mm in diameter. 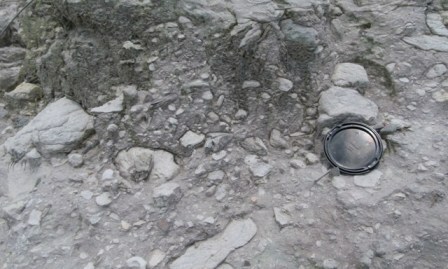 ABOVE: When water is added the clay swells and the rock rapidly breaks up. This was very lightly washed to reveal the quartz grains. The quartz grains are typically rounded to sub-rounded. the metal bar is 1 mm in diameter. ABOVE: Same as above. The metal bar is 1mm in diameter. Argillaceous Sandstone: Pale yellowish brown (10YR 6/2) to light olive grey (5Y 6/1) with ‘clasts’ of whiter argillaceous sandstone which was yellowish grey (5Y 8/1). The dried sample was firm to soft and crumbly. 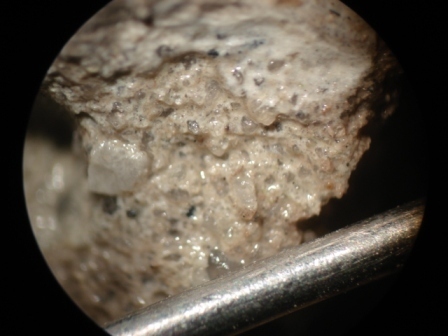 It comprised 95% quartz grains and <5% lithic/mineral fragments in a claystone matrix. 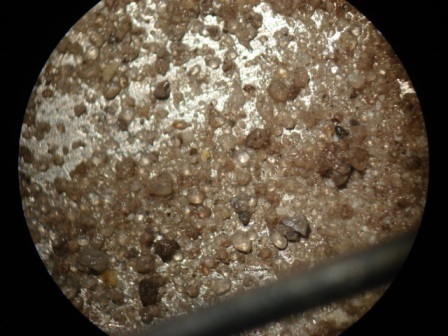 The quartz grains were typically very fine to fine sand grade (0.062mm-0.25mm) and occasionally ranging up to medium sand grade (up to 0.5mm). The quartz grains were translucent to milky translucent, sub-rounded to rounded and occasionally sub-angular, sub-spherical and poorly sorted. 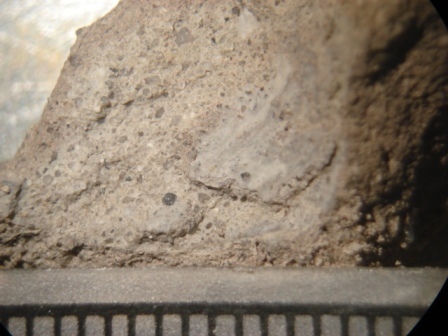 The argillaceous sandstone has a speckled appearance due to <5% lithic and dark mineral fragments (including the cassiterite tin ore). 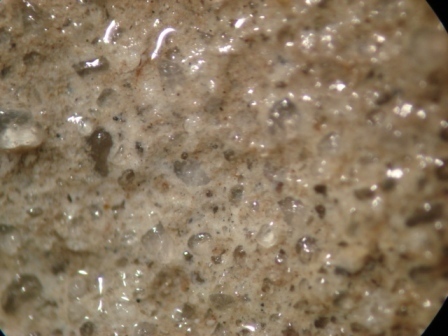 The claystone matrix was soft, sticky and had a high shrink-swell capacity (readily absorbing water). 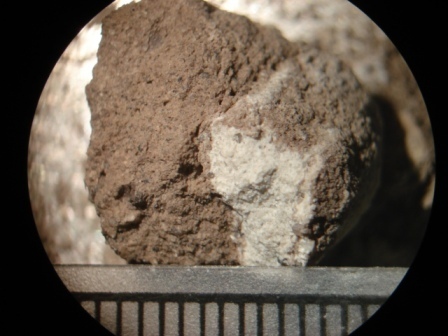 The matrix was generally clast supported, although in places it became matrix supported. This argillaceous sandstone was wholly non-calcareous. No fossils were recovered. Minor organic material, considered to be very recent plant debris/roots, was observed. 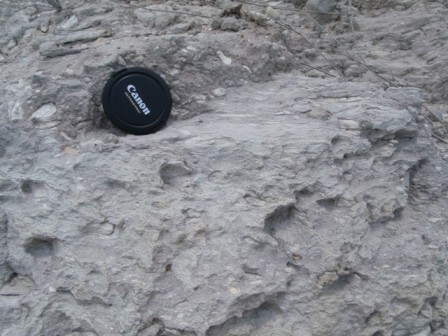 ABOVE: The clay at Tanjungpandan. The metal bar is 1mm in diameter. Claystone: White (N9) to yellowish grey (5Y 8/1) with a very slight pinkish tinge. Firm to moderately hard and brittle when dry. Very rare matrix supported quartz grains of variable size. Common ‘veining’ texture observed. High shrink-swell capacity (readily absorbing water). Non-calcareous and non-fossiliferous. Note: I'm not so convinced that tektites would be found in this fine material and I am unsure whether tektites have been found in this particular tin mine.